PEAS, rice, sugar, palm oil, mod. CORN starch, SOY SAUCE, salt, wasabi, Colours: E100, E141ii. May contain traces of MUSTARD, SESAME, SHELLFISH, PEANUTS and NUTS. 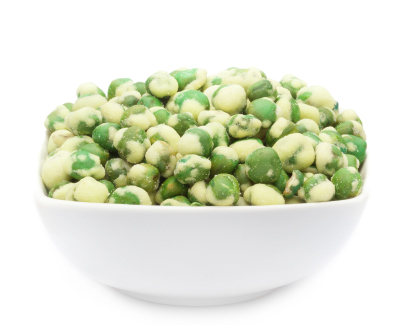 The crisp and slight sweetness of our air roasted green peas which have retained due to the gentler roasting process their wonderful green colour and the distinctive refreshing taste on most delicious are combined with a wonderfully spicy wasabi note which touches every Wasabi lover to his tears. Is probably one of the tastiest, the most interesting snack alternatives to all traditional snacks that you can ever imagine. The taste when you bite into these small grassy-green peas will blow you away. Authentic green peas flavour with the touch of wasabi is officiated as a natural flavour enhancer and the peas gives an incomparably fresh touch.You will hardly believe it, but these WASABI PEAS are fun because of its humbleness, a very, very large nibbler. That you have to try! The fresh green will be the first that stabs you in the eye when you see our WASABI PEAS for the first time. If you like it, then dare do this - uncommon at first sight - but put a snack into your mouth, and you will be completely and rightlyamazed by the incredibly crispy taste of the green peas. This snack is perfect as a small snack for in between meals or as a delicious topping on a fresh salad.